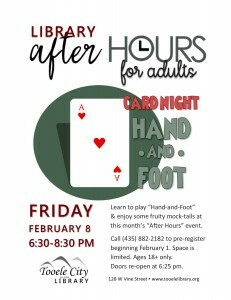 Come learn to play “Hand and Foot” and enjoy some fruity mock-tails. Call the library to pre-register (required) beginning February 1. Adults 18+ only. Doors re-open at 6:25 PM.